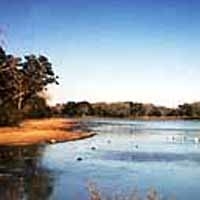 Activities include camping, boating, water skiing, jet skiing, sailing on the main lake, canoeing, picnicking (tree-shaded tables and grills), lake swimming (no designated area or lifeguard), hiking, birding and fishing.The Texas State Park Store rents canoes, hydrobikes, and single person sit-on-top kayaks, daily throughout the year. They also sell gift items, supplies, firewood and ice. This park participates in the Angler Education “Tackle Loaner Program”; individuals can borrow rods, reels and tackle boxes with hooks, sinkers and bobbers.The park offers a variety of educational opportunities, including guided hikes, wildlife programs, nature crafts and holiday events. Interpretive programs are available for groups by special arrangement. Summer interpretive programs are held on Saturday mornings and afternoons. Here's the our members favorite photos of "State Parks in Texas". Upload your photo of Lake Texana State Park!